The Meadowlands’ winter series continues, as long as the mighty storm that swept in from the Midwest has blown its way into the ocean, or at the least, far from New Jersey. But it wasn’t just the Garden State that was pelted with a deadly array of snow and ice and rain; racing was cancelled along the 2,000-mile path made by the storm. Friday, Feb. 4 pacing mares take on the cold in the Cape & Cutter Series (C&C) with the first leg. Four-year-old-and-under colt and horse pacers (though mostly aged four) open the Exit 16W Series with its first leg. Up north, Woodbine hosts a field of eight fresh soph-colt pacers in the Count B Final. On Saturday, Feb. 5, the Meadowlands hosts the beginning of the Aquarius Series for four-year-old open pacers. Speaking of exotics, on the left coast Cal Expo continues to offer the no-takeout late Pick 4 on Saturday’s program. This week it takes place on races 9 through 12. Our weekly coverage of the four included races promises to suggest strong contenders that we urge you to consider for win wagers, also. In the first division of the C&C at the Meadowlands Friday, Ideal Newton, coming off a 1:55.4 qualifier, is the morning-line favorite, but Shacked Up has better potential in this $40,000 event. “Shacked” has a new trainer. Ppreviously trained by Paul Reid, Josh Green brings the million-dollar mare back - after three starts in the open ranks at Dover. In the second division, Laughandbehappy, who has not lost a race in 2011, is returning after a three-week rest. But coming in to this is another horse from the Delaware circuit, Go On Bb. “Go” also spent time on the Indiana circuit at Hoosier Park last year. She comes in to this with some good performances at Dover. Also in the mix is Symphony In Motion. In the first division of the Exit 16W, returning to the stakes action is Ise The By Boy. He was disqualified two weeks ago for interference in the stretch and placed fifth. He struggled in a condition event last week for trainer Nikolas Drennan, who won the $127,000 Presidential Final last week with Alexie Matossie and finished second in the $62,600 Clyde Hirt final with Sniper Seelster. Also watch Freddy Day Hanover in this event. Last week he attacked Summer Camp but was caught for the win by Meirs Hanover, Sniper Seelster and No Monkeys Allowed. 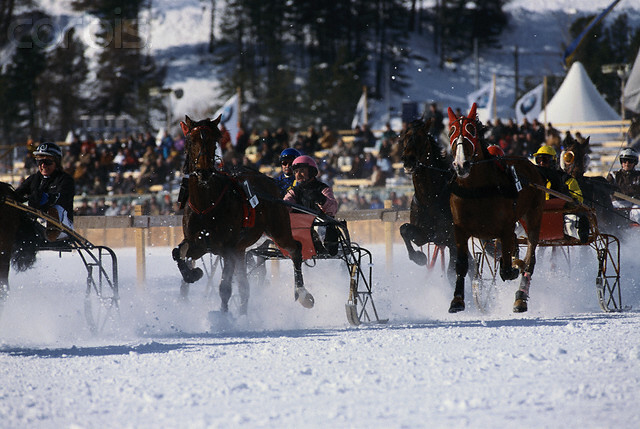 In the second division, the two top competitors were one-two in the “Hirt” final – Meirs Hanover and Sniper Seelster. But look out for Arts Fav’ Won. He spent weeks at Yonkers but won his first race of the year at the Meadowlands. At Yonkers he had some troubled races. In the first division of the Aquarius on Feb. 5, Allthatgltrsisgold comes off a win in the Aquarius Preferred event last week. He is new to the care of Larry and Ray Remmen. Previously trained by Bobby Brower, he raced at the Meadowlands in the $500,000 New Jersey Classic. Now he is trained by the same connections that trained Shark Gesture. Also in this, watch out for Triple Major. In the second “Aqua” split, there are two very strong competitors –Art Professor and Windsong Gorgeous. This year, “Gorgeous” was runner-up to St Elmo Hero in that one’s last four winning starts and is vying for his first 2011 victory. Art Professor was a strong competitor in the Willowdale Stakes at Woodbine. “Art” could be a profitable choice in any exotic or on-the-board wagers. At the Meadowlands for the month of February, the guarantee on the Saturday night Pick 4 is being raised from $75,000 to $100,000. The Pick 4 features a 15-percent takeout. The wager paid an average of $4,313 in 2010, returning more than $1,000 over 50 percent of the time. A record $70,446 was recorded on March 26, 2010. And on TwinSpires, all winning tickets will be worth 10-percent more if hit from our site. The pick 4 starts in Race 6 and ends in Race 9. Race 6-(4) Blueridge Western- A fierce horse in FFA company last year, he spent some time in the conditioned ranks at Yonkers and makes his 2011 debut on the mile track. Takeshigamichi (5) comes off a good qualifier and was competitive in condition company as well, it will be exciting to see how 2011 works out for this guy. Shark Dressed Man (6) has not disappointed yet this year; he keeps winning after finishing second at more than 80-1 at the beginning of the year. He is tough to beat. Race 7-(4) Bongo- Stepping up from his 100-1 upset last week, he may repeat an upset in here, though maybe not with as high odds. Talbot Redneck (7) finished third last week at 12-1. He has a win on the half-mile. Race 8-(3) Mcclelland- One of the early choices after his win in the first leg of the Complex. Trainer Aaron Lambert finished second last year in the Exit 16W with Woodstock Hanover and “Woodstock” was just caught by Pacinello in that race to finish second by 3 lengths. Master Stroke (6) is stepping down from last week. He went for the front but couldn’t hold it. Stepping down in to this class should help. Race 9-(5) Worthys Magic is looking for his second win this year for trainer George Anthony. He went a 1:52.4 in his victory. Anthony also trains Don’t Fool Me Now, who won is first race this year also. Boo’s Boy (10) had a first-over trip last week and can hopefully will pick up cover, not burning out on the front. That ticket would cost you $24. Add or minus any horses to accommodate your budget. Going at Woodbine on Feb. 4 a solid group of eight youngsters, soph-colt pacers, contest the Count B Final, worth $60,000. It may the only chance for any of these to shine all season in the glamour-boy group, as the freshmen recently graduated to sophomores rarely hang around to face the big guns in the top stakes. There were no elims for this event, owing to the lack of entries. The public may have a good chance to make chalk the champion in this event, as the recent win by Dapper Denzil as the choice was impressive. It included an overland move that he could not overcome the race before, when he got third going the long way. A good, albeit obvious, second choice will be Machal Jackson, who took second last out, also negotiating the second tier. The definite outsider of the top three is Fox Valley Yukon. At 18-1 last time out he finished fifth with reasonable excuses. First, he left from post 10, still showing early foot. He stayed afloat through the stressful mile in heavy traffic, to grab a piece of the purse. Watch his odds and use him as the overlay key. It’s always dangerous to predict an easy-to-handicap quartet in this exotic but these four races may prove to have a lot of winning tickets. Digging for what may be overlays could be the main challenge and a good reason to keep your ticket or tickets small. Race 9 – Taxi Dancer comes off a giant win and looks good enough to save some ground and drive hard from post 6 to eat this group alive. He was the choice last time and should be favored here. We nailed Kikiskissinkousin last out at a price but like most of this field she has skipped a week of racing. You could add her but “Taxi” may start it all off with a short price. Race 10 – Jungle Girl, who was on our watch list a few times, shocked last week with a 21-1 score. She gets post 1 this week and doesn’t have much to face, though she probably won’t go off that long this time. One outsider, the 9, Ogs Si Bon had a strong race last out, finishing out of the money after gaining significant ground overland at 8-1. Race 11 – Thouartthegreatest was strong, though hung, to three-quarters last out at 2-1. He could make amends but may not escape the eyes of the public. Freedomize continues to cash checks but doesn’t strike the big note. The only outsider with a slim chance seems to be Rocket Scientist, who had a good last half, gaining, at 7-1. Race 12 – Blissful Kassie was filled with fire early dueling for the top last out. She got there with a fight and that cost her, fading at 52-1. Beaten-favorite Red Star Gilda had little excuse tanking but could have put in a clunker. Whoop And Shout is a danger from the inside. So, keeping all of our contenders in the ticket –6/1,9/3,7/1,5,8—you go with $12. Should you not involve the probable outsiders mentioned, you could get away with a 6/1/3/1,5 for $2. Remember, however, that either way you need to consider win wagers on the longer priced contenders, as well as watch for overlays with the horses we predict will be favorites. At Maywood on Feb. 4, we have six horses to watch: Race 3 (4) Island Tiger; Race 6 (7) Fox Valley Trident; Race 7 (2) Free Parkin Behind; Race 9 (7) Lee Ave; Race 11 (6) Tricky Grin; and Race 14 (4) Intimate Hall. At Dover on Feb. 5 the five horses to watch: Race 2 (6) Drew Bromac N; Race 3 (8) Scootin Cammie; Race 5 (7) Skedaddle Hanover; Race 8 (1) Scarlet Ibes; Race 9 (4) Dirty Devil.